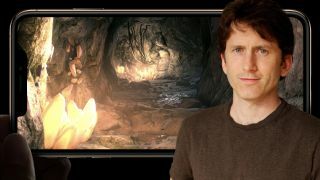 "You've never experienced the Elder Scrolls like this, and on your phone"
Todd Howard is everywhere these days, including on stage at today's Apple event where the company showed off the new iPhone XS and iPhone XS Max. The new devices were the perfect chance to show off more of the new handheld RPG The Elder Scrolls: Blades, and the Bethesda director promised big things for the mobile spin-off of its hit fantasy series. "It's not just immersive, it transports you," he promised. "Scenes like this used to be only be possible in your living room, on a high-end console," noted Howard, pointing out how the light in the world was reflected on water and bounced off dungeon walls and your sword. We didn't get to see too much actual gameplay - not when Apple had other products to sell - but The Elder Scrolls: Blades looked fantastic on the livestream. "We've been able to pull off some incredible environments that just weren't possible before. 12 year-old me would not be able to comprehend all these pixels, all 2.7 million of them." "You may have fought dragons in Skyrim, but you've never experienced the Elder Scrolls like this and on your phone," said Howard. Howard said the release date for The Elder Scrolls: Blades was 'fall,' and with Bethesda on stage at Apple, you can probably expect it to follow the release of the new iPhone on September 21. You can register for early access now, and pre-order on the App Store. If you’re looking to kill time, boredom, or just want to sample the very best iOS has to offer, check out our 25 best iPhone games.